These fascinating issues are among the smallest coins ever made. They may also be among the first coins ever produced in silver. Their mint has not been established with certainty, but all the known specimens (with one possible exception; see below) are Lydo-Milesian ninety-sixth staters, and so they belong to the general region of Miletus. What is particularly interesting is the five-dot reverse, which bears a strong resemblance to the quincuncial reverse common to the electrum staters, thirds, sixths, and twelfths that have been assigned to Miletus with some confidence, and that are among world’s first coins. While some authors have suggested Erythrae as a possible mint for these tiny silver fractions because of the similarity of the obverse to some later Erythraean rosette designs, I provisionally assign them to Miletus on the basis of the quincuncial reverse. Dr. Busso Peus Nachfolger, Auction 372, Lot 325 (30 October 2002), via coinarchives.com. Dr. Busso Peus Nachfolger, Auction 376, Lot 413 (29 October 2003), via coinarchives.com. Note: Bärbel Pfeiler (1966) has also assigned these small silver fractions to Miletus. Her work has just become available in English translation, and I have not yet incorporated her brief conclusions into this page. The obverse has sometimes been described in sales catalogues as an eye, but when a series is examined it is clear that variation exists in the design. Some specimens, such as RJO 63, show something like an eye with its iris and pupil, while others, such as RJO 56, exhibit a clear seven-spoked swirl pattern. The twelve specimens illustrated here may constitute one of the largest existing collections of this tiny, obscure coin. 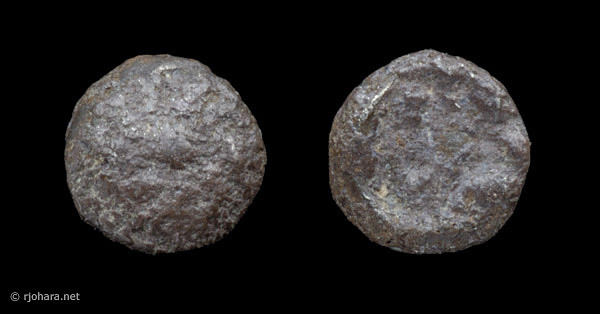 This type has in the past been described only from specimens that weigh approximately 0.15 g, the standard weight of a Lydo-Milesian 1/96th stater, but a single specimen (RJO 110), described separately below, appears to be a 1/192nd rather than a 1/96th. RJO 43. 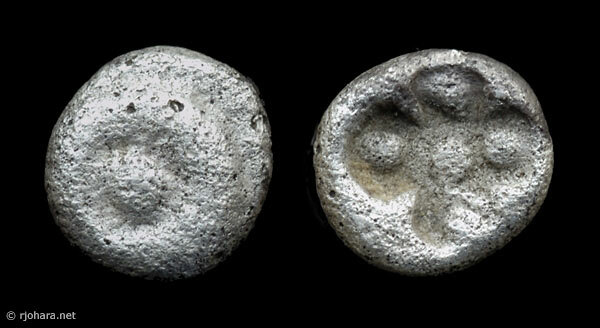 Silver 1/96 stater (0.12 g), about 550 BC. 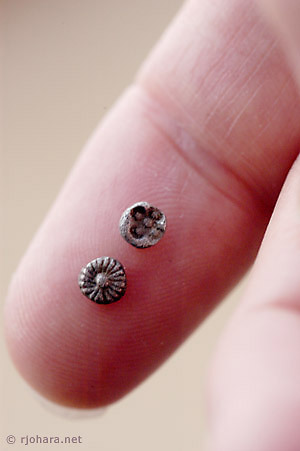 Obverse: swirl pattern around a central dot, worn but detectable under magnification. Reverse: incuse quincunx. RJO 56. Silver 1/96 stater (0.11 g), about 550 BC. Obverse: seven-spoked swirl pattern. Reverse: incuse quincunx. RJO 57. 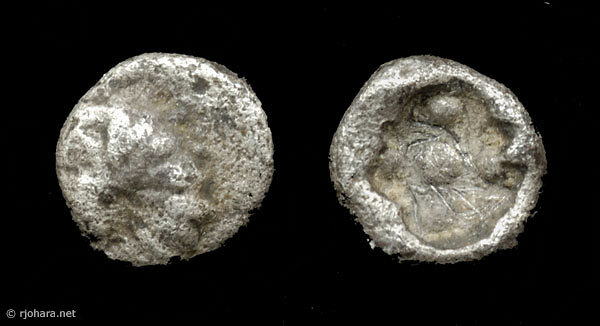 Silver 1/96 stater (0.12 g), about 550 BC. Obverse: swirl pattern, worn but detectable under magnification. Reverse: incuse quincunx. RJO 62. 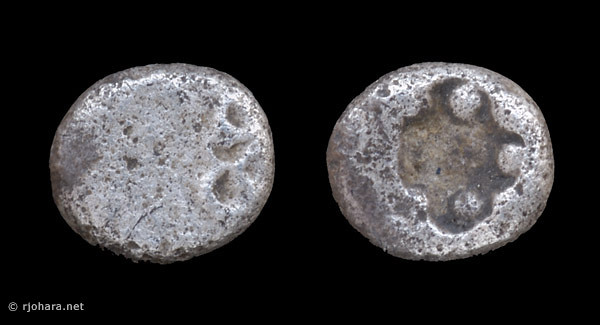 Silver 1/96 stater (0.13 g), about 550 BC. Obverse: swirl pattern, worn but detectable under magnification, partly off the flan. Reverse: incuse quincunx. RJO 63. 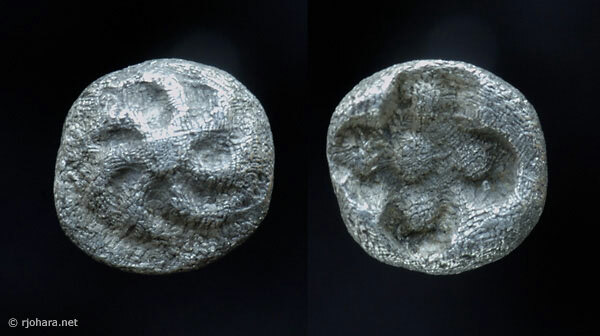 Silver 1/96 stater (0.12 g), about 550 BC. Obverse: rosette pattern around a central dot, half off the flan. Reverse: incuse quincunx. RJO 64. 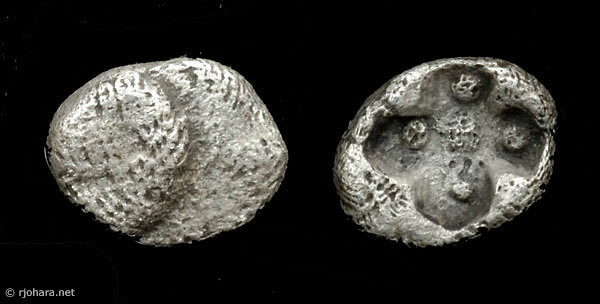 Silver 1/96 stater (0.16 g), about 550 BC. Obverse: swirl pattern around a central dot. Reverse: incuse quincunx. This specimen looks as if it might have slipped under the strike and the types are consequently somewhat blurred. The obverse may be close to the seven-spoked design of RJO 56, while the reverse does not show the quincunx pattern clearly. RJO 67. 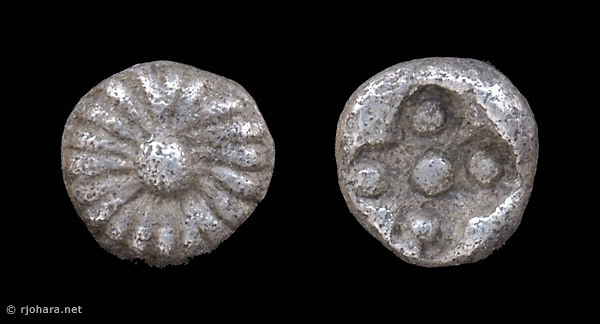 Silver 1/96 stater (0.14 g), about 550 BC. Obverse: apparent swirl pattern, largely off the flan. 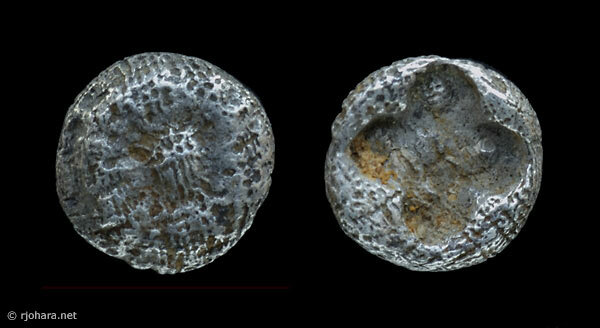 Reverse: incuse quincunx, worn so that only three pellets remain clear. RJO 69. 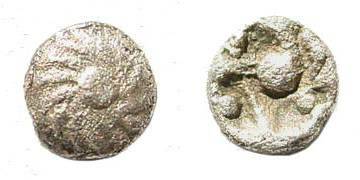 Silver 1/96 stater (0.16 g), about 550 BC. Obverse: well-centered rosette or eye-like design, with nineteen spokes radiating from a central dot. Reverse: incuse quincunx, not perfectly square. RJO 71. 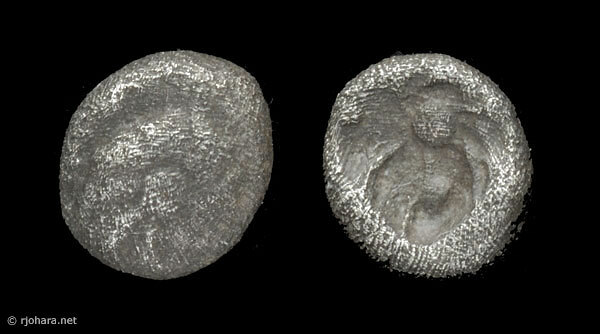 Silver 1/96 stater (0.14 g), about 550 BC. Obverse: swirl pattern or eye-like design. Reverse: incuse quincunx. RJO 76. Silver 1/96 stater (0.11 g), about 550 BC. Obverse: swirl pattern or eye-like design, considerably worn. Reverse: incuse quincunx, considerably worn. RJO 109. 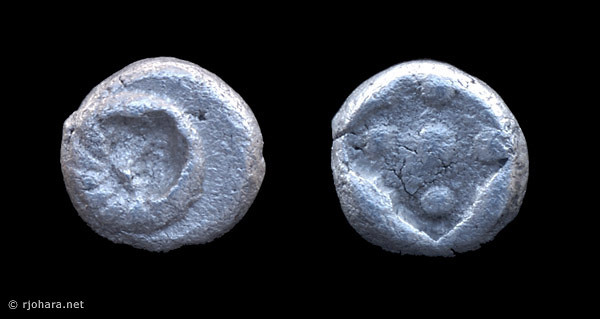 Silver 1/96 stater (0.10 g), about 550 BC. Obverse: well-centered swirl pattern or eye-like design. Reverse: incuse quincunx, irregular and seemingly misshapen. As noted above, all previously described examples of this type have been Lydo-Milesian 1/96th staters, with a standard weight of about 0.15 g. The single specimen described below, which is tack-sharp and exhibits no obvious corrosion of any kind, weighs half as much and appears to be a 1/192nd. Konuk has described a Lydo-Milesian electrum fraction that he believes is a 1/192nd (2003: 33), but I know of no silver fractions of any type that have been assigned to this denomination. RJO 110. 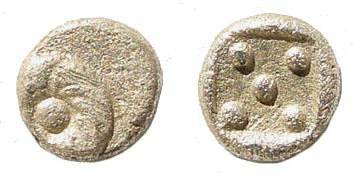 Silver 1/192 stater (0.07 g), about 550 BC. Obverse: swirl pattern around a central pellet, off-center but very sharp. Reverse: incuse square with five raised pellets in quincunx pattern.